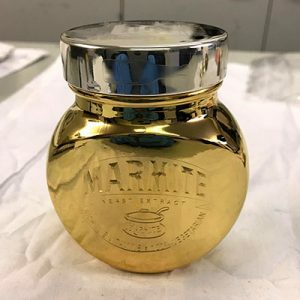 24k Gold Plating a promotional Marmite Jar! Last week Gold Rush Plating was asked to help out in a PR video for Marmite. We were asked to gold plate a jar of Marmite for an up-coming promotion. The jar was copper plated, then silver plated and finally gold plated. We offer a full range of Plating services as well as gold plating. Silver plating, Rose gold plating, Rhodium plating and others. Good news, we can now gold plate the Apple Watch. Here at Gold Rush Plating we specialise in Gold and Silver plating on a wide range of items from jewellery to car parts and lightening rods to R&D components. We have been given extra discount from our suppliers until the end of September on certain plating solutions – Which we are passing on to all our customers! Vermeil is a process of plating gold onto silver, it needs to be a minimum thickness of 2.5microns and at least 14ct in quality to be considered vermeil. We have been doing a lot of plating for small and home jewellers, one of which has just had her pieces excepted to a well know high street retailer! We have had lots of jewellery as usual, but a lot of new commercial and engineering work as well. The new red and green gold has been selling well and of course are new “thick coat silver” is going down a storm. Gold plating and Silver Plating have kept us super busy as always, but Rose Gold plating and Nickel plating have been high on the orders lately. We are currently plating the entire exterior chrome trim including the front grille on a Rolls Royce in 24k Gold. The project is almost complete so check out our FaceBook page to see the photos soon. Well its been a busy few weeks at Gold Rush Plating. We have had several car parts, badges and trim in for gold plating, the summer car shows are just round the corner and gold plating seems to be the in thing! Gun parts have also been popular lately with triggers featuring highly. More 24k gold plated parts for palaces in Dubai have kept us behind late into the evening as well. Silver plating on jewellery is always popular and we have a dedicated tank system for this. We have been very busy at Gold Rush over the last few weeks. We have just completed two large projects for an Airline and numerous small to medium projects for UK companies. Our home and individual jewellery makers have also been very busy, sending us lots of Gold, Rose and Silver plating work – Many thanks to all those customers, your trust in us is much appreciated. We have just received a solution of Green Gold, which looks great – Please let me know if you would like a sample.